This fund was established in 2010 to provide tuition assistance for talented high school students in Maine to attend the Young Artists summer program. Thanks to the generous support of many anonymous benefactors, up to $10,000 in full and/or partial scholarships will be awarded to teens who express an interest in media arts through their application submission and who can demonstrate the need for financial assistance. Application is by letter of interest, evidence of financial need as demonstrated on the application form, accompanied by parent/legal guardian’s latest tax return, and 3 letters of recommendation. Samples of previous work must accompany applications for assistance in advanced workshops. Otherwise, no portfolio review is required. Deadline for submissions is 5 pm, April 26, 2019. Awards will be announced the week of May 6, 2019. Materials must be sent electronically to: [email protected] Portfolios must be placed online for viewing. A gift from The Arnold and Augusta Newman Foundation has established a scholarship to honor the memory of Arnold Newman, one of the great masters of photography in the 20th century. 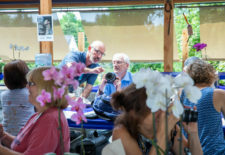 This endowment will be used to assist talented teens to advance their love of photography by attending one of the many programs offered in Maine Media’s Young Artist Program. Arnold, the father of the “Environmental Portrait”, was a generous teacher and taught at Maine Media every summer for over thirty years. He was a great believer in the intensive mentoring process that happens at the school and thoroughly enjoyed asking young photographers to sit with him and share their work. These informal portfolio reviews launched more than one currently successful photography career. Application is by letter of interest, evidence of financial need as demonstrated on the application form, accompanied by parent/legal guardian’s latest tax return, and 3 letters of recommendation. Samples of previous work must accompany applications for assistance for advanced workshops. Otherwise, no portfolio review is required. Deadline for submissions is 5 pm, April 26, 2019. Awards will be announced the week of May 6, 2019. Materials must be sent electronically to: [email protected] Portfolios must be placed online for viewing. We are again pleased to announce the availability of scholarships for the Young Artists Workshops. The Kevin McCabe Memorial Scholarship will be awarded to a deserving and talented student photographer (film or digital) from Central New York State region. The family and friends of Kevin McCabe, a Young Artist alumnus, have established this scholarship in his memory. A second scholarship, also awarded in Kevin’s honor, is offered by Maine Media and is open to all Young Artists world wide. Both of these scholarships provide full tuition, lab fees, lodging and meals. All applications will be judged based upon a combination of evidence of need and the merit of the work. All applications must include a financial statement (tax return) of the parent(s) or legal guardians. 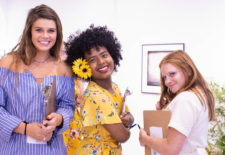 Three letters of recommendation from professional photographers, filmmakers, Workshop Alumni, or teachers must also be included, as well as a personal statement and the application form. Samples of previous work must accompany applications for assistance for advanced workshops. Otherwise, no portfolio review is required. Deadline for submissions is 5 pm, April 26, 2019. Awards will be announced the week of May 6, 2019. Materials must be sent electronically to: [email protected] Portfolios must be placed online for viewing. Two generous benefactors have established a fund that is specific to teens from a culturally or ethnically under-represented background. Applicants are likely to be recent immigrants. Referrals may come from high school educators, friends or others with some knowledge of the specific situation. Some funds available provide a priority to students from Maine, with a priority to the Portland, or Lewiston-Auburn areas. Portfolios are not required, unless an advanced class. Friends are encouraged to apply together. Applicants must complete the scholarship application form, include 3 letters of recommendation and submit a parental/guardian tax return, if available. A personal statement describing the applicant’s situation should also be included. Deadline for submissions is 5 pm, April 26, 2019. Awards will be announced the week of May 6, 2019. Materials must be sent electronically to: [email protected] Portfolios must be placed online for viewing. Partial tuition scholarships are available to deserving applicants through donations by corporations and individual benefactors to Maine Media. Funds are intended to support the educational process of today’s most talented teens. Application is by evidence of financial need as demonstrated on the application form, accompanied by latest tax return and 3 letters of recommendation. 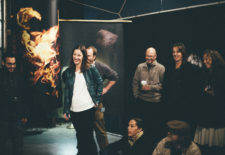 A portfolio submission (15-20 images) or reel is required for entry to advanced workshops. No portfolio required on intro level workshops. Deadline for submissions is 5 pm, April 26, 2019. Awards will be announced the week of May 6, 2019. Materials must be sent electronically to: [email protected] Portfolios must be placed online for viewing.